Master’s Degree Programme in Educational Sciences (EDUMA) attracts a wide range of students internationally. We have admitted students to our international master programmes yearly since 2007 and into EDUMA programme since 2013 with a global application process. We merged our programmes in Educational Sciences and Educational Leadership in 2017 and now operate with one programme that has six different specialisation options. The backgrounds of our students vary from educators who have just completed their Bachelor’s degrees to those with several years of teaching or other experience in the field of education. Motivation for professional development brings students from different cultures together and creates a diverse learning environment where different views are shared and valued. Students are encouraged to create possibilities for collaborative learning in dialogue with teachers and fellow students by actively discussing and sharing their own, unique experiences. 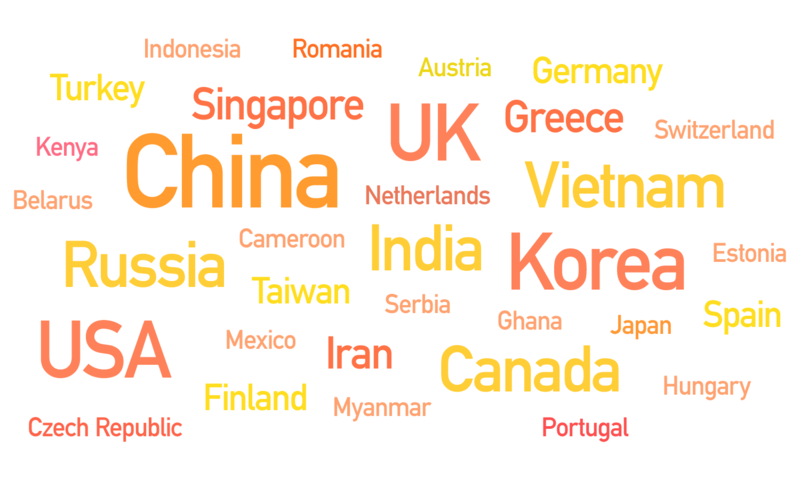 The wordcloud shows the approximate distribution of our former and current students’ nationalities. Read what some of our current students have to say about their experiences of studying and living in Jyväskylä, Finland. Be sure to check out our student blog too! "Critical reading and thinking, learning reflection, personal diary or group working with awesome friends provide me possibilities to learn, explore and reflect deeply." "I think the culture in the university can’t be better, unlike than Spain it is very relaxed, the main point is learning and because it happens differently for each student it’s possible to adapt your studies to your interests and necessities." Sign up for our newsletter to receive more information on studying at the University of Jyväskylä.